The Alaska Brain Injury Network (ABIN) mission is to educate, plan, coordinate, and advocate for a comprehensive service delivery system for brain injury survivors and their families. Our vision encompasses a lifetime of care and services, which are both affordable and close to home. Each donation we receive through Pick.Click.Give. helps the Alaska Brain Injury Network take another step towards ensuring that every traumatic brain injury survivor or their families in Alaska obtain the resources they need. Over 13,000 Alaskans currently are living with a traumatic brain injury. A brain injury can happen in an instant -- a fall on the ice, a car accident, a big hit during a football game -- but the effects can last a lifetime. Many of the brain injury survivors we work with are children, seniors, veterans, and assault victims. Every donation we receive through Pick.Click.Give. makes a difference. A $25 gift can help us provide information packets to brain injury survivors when they are discharged from the hospital, so that they can start physical and occupational therapy right away. 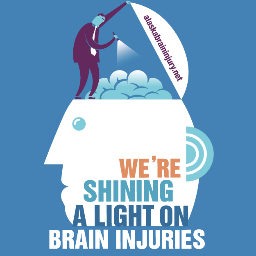 A $50 contribution can help us arrange more brain injury trainings for medical providers. A donation of $75 or more will allow us to visit heath clinics, communities and schools across Alaska to raise awareness of brain injuries and educate more Alaskans about how to prevent brain injuries from occurring, particularly in rural areas where traumatic brain injury rates are the highest in the state. Thank you for your support of Alaskans living with traumatic brain injury.